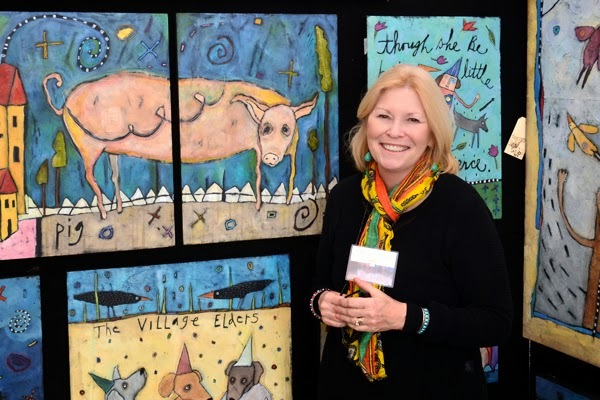 There are artists I look forward to seeing every year at the Atlanta Dogwood Festival, Greg Stones and Elaine Rader, to name two, and I always enjoy meeting new artists, new vendors, new organizations, and especially new personalities. I had the great pleasure of being a media guest in the VIP tent this evening...and a great evening it was. The weather was perfect, I ran into several friends in the media (Great to see you especially, Carol! ), the bar-b-que was fantastic, and I got to hang out with several of my Museum of Design Atlanta (MODA) friends. 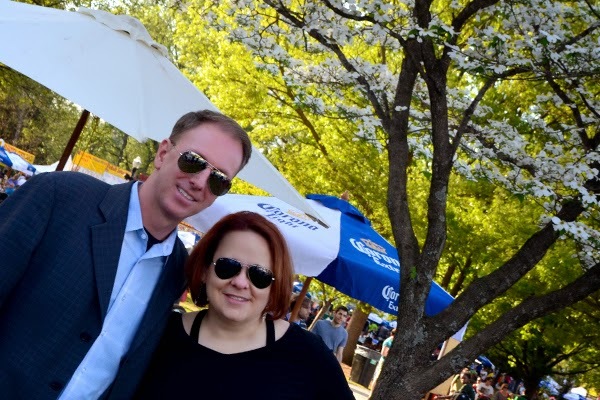 That's Executive Director Laura Flusche and me in the above photo, and yes, it's tilted so I could get some dogwood blossoms in the photo...it's the Dogwood Festival! And did you notice...we have the same sunglasses! 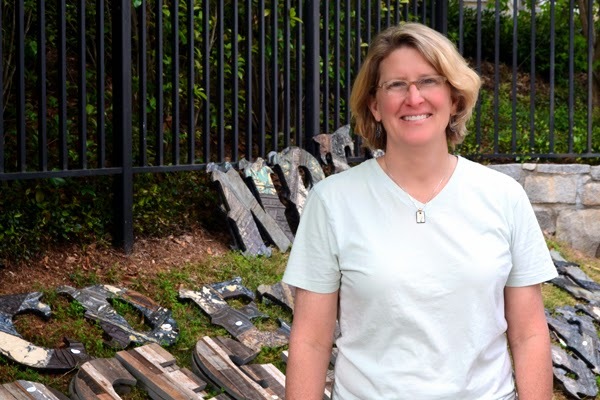 MODA is this year's Lead Cultural Alliance Partner of the Atlanta Dogwood Festival...AND the annual "The Great Chair Hack" will take place tomorrow afternoon near the 12th Street Entrance. Last year's competition was FUN! Yes, there are penguins in Piedmont Park...at the Atlanta Dogwood Festival to be more precise. 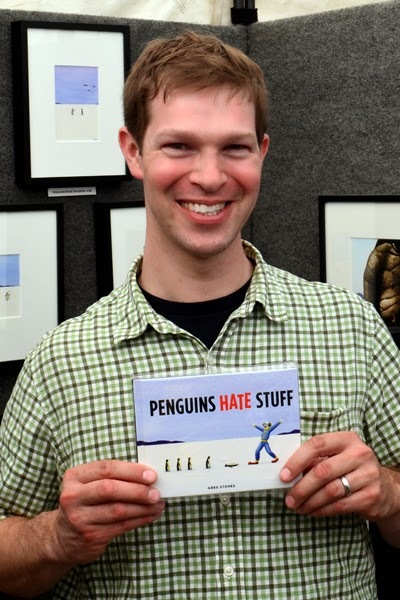 Greg Stones, 2013 blue ribbon award winner in the 'Painting-Watercolor/Pastel' category, of Watercolors by Greg Stones, is back with his most recent book, Penguins Hate Stuff, and LOTS of new paintings. I've mentioned Greg numerous times since starting wanderlust ATLANTA several years ago...because he's one of the funniest people I know! And he's a brilliant artist. He's one of those people who even though you don't see very often, always feels like a great friend when you do. This year I wanted to feature some Georgia artists, ones who I've not met before, so I introduced myself and chatted with a few whose art grabbed my attention. Kathleen Taylor of Kathleen Taylor Studio is so incredibly sweet, as is her artwork. No, she's not a relative...it's a total coincidence that we share the same last name. But I have to say that I have great admiration for her approach to her paintings. Inspired by her dogs and other animals, she keeps her works positive, upbeat, and most importantly "happy"...you gotta love that! Believe it or not, I wasn't purposely seeking out all the artists with the last name Taylor...it just so happened that the next one I spoke with was Margaret Taylor of Dryads Dancing. Talk about coincidence! As an aerospace enthusiast, there was a wooden plane in her booth that caught my attention, and then a wooden goat caught my attention, and then a lawn of letters...which then triggered my memory. A couple of years ago I was at the Festival with my friend Michele (that's not a misspelling, he's Italian) who purchased two of Margaret's large metal-covered letters as a gift for a couple of his friends. He says they love them! Margaret's work is truly fantastic...stop by and you'll see what I mean. You already know there are penguins in Piedmont Park, but would you believe that there are also flying pigs in Piedmont Park? It's true! You can't miss them. The Creative Creations space is filled with fun, festive, and bizarre creations designed for one's garden. 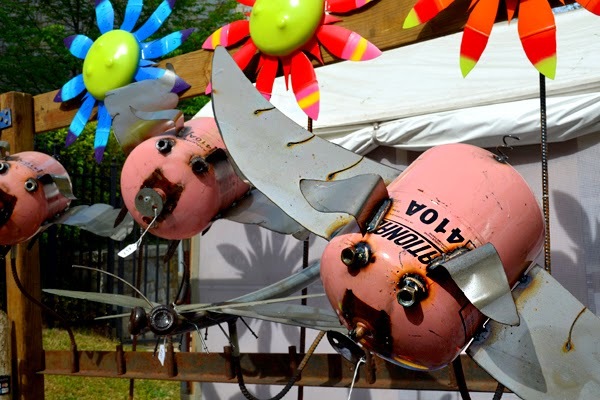 Out of Woodstock, Georgia, artists Jimmy and Marlene's work is sure to entertain, whether guests of a backyard party or family helping out in the vegetable garden. Penguins and pigs we've seen...and I promised personalities. 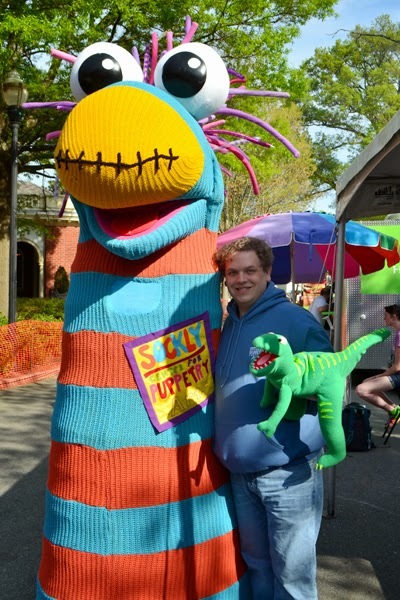 There are plenty of personalities at every Atlanta festival, but today I had the pleasure of formally meeting Sockly, the mascot of the Center for Puppetry Arts...and man, is Sockly tall! This was Sockly's first Atlanta Dogwood Festival, but the second time I've met Daniel, the Marketing Director at the Center. You may recall that he recently toured me around the Center for Puppetry Arts, particularly the temporary exhibition featuring masks from the Broadway production of The Lion King. By the way, I saw The Lion King at the Fox Theatre last night and it blew me away...absolutely fantastic! And I have to say, seeing several of the masks up close enhanced my experience of the stage performance. I highly recommend seeing the exhibit. 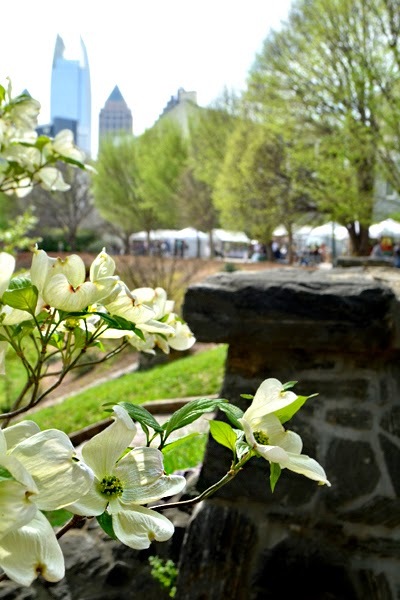 This year's Atlanta Dogwood Festival features not only wonderful artists, special events, live music, festival food—as well as some super fun penguins, pigs and personalities—it also feature a forecast for absolutely gorgeous weather, all weekend long! So, stop reading this and get yourself to the Festival. Have fun!